Sadly, I have to travel pretty far to see this much undeveloped space. Beautiful image Rebecca. I also like the rest on your website when you click on this image. The school house, up close looks pretty neat, and I love that landscape! Great lone school house Rebecca. If they would just stop building new things and just use ones that are sitting empty the world would be a better, less crowded place. Open space is getting harder and harder to find, that's for sure! As much as I like looking at views like that, when passing by, I realise that I would not really want to live in the open countryside myself. It sure is gorgeous and the sky is such a splendid blue! I love the wide open spaces. We live in a small subdivision in the country. Have neighbors but within walking of plenty of open space. Mostly horse country around here. It's beautiful. I love driving by scenery like this. It's my favorite, besides old historical buildings. Beautiful! 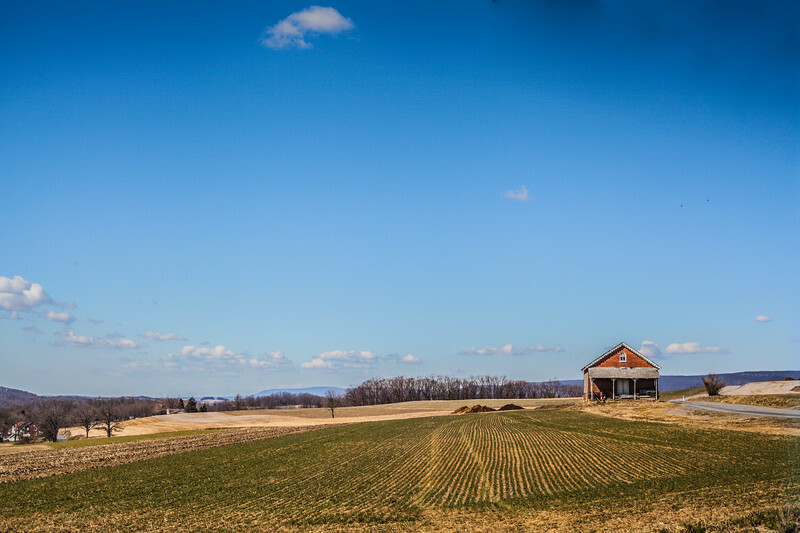 The quaint little building, the drift of clouds across a blue, blue sky, the lines of the furrows. Speaks to me of tranquility. Beautiful picture, Rebecca. I noticed the leading lines, too, as Ginger mentioned. They add an extra dimension to the image which is already a feast for the eyes. That is so much space! I really envy you, my tiny island is too jam packed with buildings and more buildings.